View More In Point & Shoot Digital Camera Bundles. 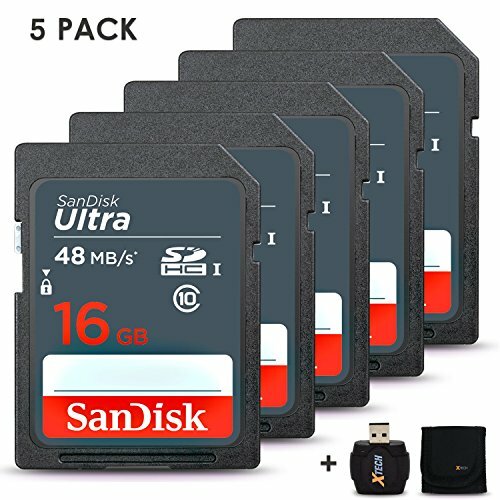 Included are 5 x 16gb Sandisk Memory card totaling 80gb, this will give you plenty of memory space to store all your favorite pictures and video clips in HD. Kit includes memory card reader for conveniently transferring data and a memory card walle to conveniently store your memory card all in one place. Memory card is compatible with Digital, DSLR & Point and Shoot camera and camcorders. CANON EOS Rebel T1i T2i T3i T3 T4i T5 T5i T6 T6S T6i T7 T7i SL1 SL2 CANON EOS 60D 70D 77D 80D 300D 350D 400D 450D 500D 550D 600D 650D 700D 750D 760D 800D 9000D 1000D 1100D 1200D 1300D EOS 5D Mark ii iii v 6D 7D Mark ii. Nikon D3000 D3100 D3200 D3300 D3400 D5000 D5100 D5200 D5300 D5500 D5600 D7000 D7100 D7200 D7500 D600 D750 D800 D800e D810 D810E D850D D90. CANON Powershot G5 X G9 X G3 X SX410 IS SX530 SX60 HS G7 D30 SX520 SX400 G1 X Mark II SX700 SX730 HS SX620 SX720 HS SX710 SX610 G9 X Mark II G7 X Mark II SX540 SX420. NIKON Coolpix A900 B500 B700 L840 L830 W300 W100 P900 P610 AW130 AW120 S9900 S9700 W300 W100 A300 A900 A10 A100 AW130 S33 S9900 S5700 S6900 S3700 S2900. Sony Alpha A9, A7R II, A7 II, A7 A7R A7S A6500 A6300 A6000 A55 A65 A77 A99 A900 A700 A580 A560 A550 A500 A450 A390 A380, NEX-7 NEX-6 NEX-5T NEX-5R. 5 PACK SANDISK 16GB SD MEMORY CARD a total of 80gb gives you plenty of space to store all your favorite pictures and videos. IDEAL CHOICE for Point and Shoot, Digital & DSLR Cameras, Camcorders and PC Computers, the card has a Class 10 Rating which enables capturing exceptional video recording at Full HD (1080p) and overall captures pictures at an exceptional high quality. MEMORY CARD READER is Included for easy, fast transfer of data to any PC or comp with a USB port. MEMORY CARD WALLET is included, the memory wallet keeper has separate compartments to conveniently store each memory card individually. RELAX YOU ARE IN GOOD HANDS all memory cards and accessories by Xtech include a 100% satisfaction warranty so the you can use your new memory card with extra peace of mind.